A stunning platinum and 18kt yellow gold ring featuring 3 Canadian diamonds; with the centre being a round brilliant cut est. 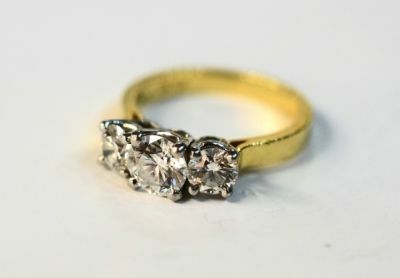 0.79ct (SI1 clarity & G colour) and the other 2 also round brilliant cuts, est 0.76ct (SI1 clarity & G colour). They are from the Ekati Mine. A three gemstone design is also called a Trinity ring.